In stock -This product will ship today if ordered within the next 7 hours and 18 minutes. The flavonoids present in this formula are among the most potent natural antioxidants available. Sambucol can help support and maintain the immune system. Contains active ingredients Antivirin, Zinc and Vitamin C. Pleasant tasting. Developed by Virologist Dr. Madeleine Mumcuoglu, Sambucol products can help support and maintain the immune system. Sambucol Immuno Forte is pleasant tasting. A unique formula based on black elderberry extract; including active ingredient Antivirin, Zinc and Vitamin C.
Sambucol is the most extensively researched Black Elderberry extract. Sambucol products are all-natural, suitable for the entire family. Glucose syrup, black elderberry extract, purified water, vitamin C (ascorbic acid), acidity regulator: citric acid, zinc gluconate, preservative: potassium sorbate. Do not take if you are likely to become pregnant, except on the advice of your doctor. 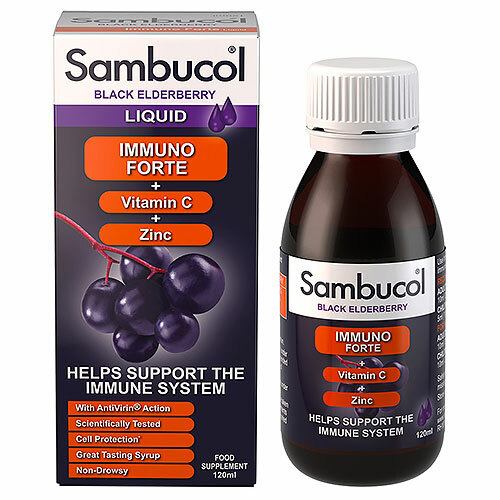 Below are reviews of Sambucol Immuno Forte - Black Elderberry + Vitamin C + Zinc - 120ml Liquid by bodykind customers. If you have tried this product we'd love to hear what you think so please leave a review. The flavonoids present in this formula are among the most potent natural antioxidants available. Can help support and maintain the immune system. Contains: Antivirin, Zinc and Vitamin C.